An innovative solar charger case provides a charge directly to the mobile device under any lighting condition. 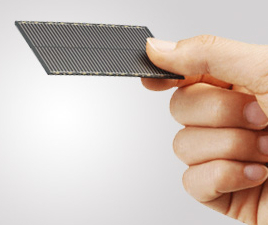 The SolMate is not your typical solar charger. The inventors claim that it might be the answer to the frustrating battery drain issue on smartphones. There are a number of mobile solar charger, but you have to be in direct sunlight to get any charge out of it. With SolMate, you can charge in the shade. Although, you will not get as good charging as in direct sunlight. But it should be able to provide enough stand by current and a bit of charge under almost any lighting conditions. The solar panel used on the device is powerful enough to charge from natural and artificial light. 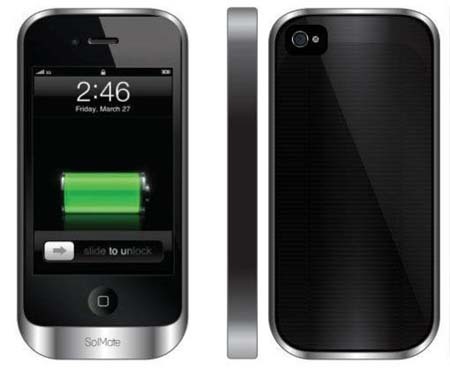 The SolMate system is made of razor-thin, high-efficiency, custom-made solar panel that affixes to the back of the iPhone. A 16-bit microcontroller circuit board provides the current. A backup battery runs at the base of case to manage the power between the solar panel, the charger and the phone. A custom application also provides details on the power usage. Lastly its case is made of aluminum frame. The SolMate is marked under the company “GreenSimian”. With two inventors who have worked from highly reputable technology companies. Adam Benzion, a former Microsoft employee, and Jamie Wojcik, a former designer from Texas Instruments. Beyond that the SolMate is highly polished compared to cheaper solar charger alternatives. Solar charger is not a new technology. But what makes the SolMate unique, is its innovative solar charging capability and the sleek design and solid looks. It is a kickstarter project. Kickstarter is a crowd funding website that allows everyday gadget lovers like you and me to invest in ideas and products. By investing, you can get early access to the products and help bring cool gear to life that might never have made it to the market. The company is set to start production this May. But there is no official release on the price yet.